Curious though, the new bride asked her mother why she cut the ends off the brisket before putting it in the roasting pan. “Because that’s how my mother always did it,” she answered. The new bride then asked her grandmother who also said, “Because that’s how my mother always did it.” The new bride finally went to the source and asked her great-grandmother why she cut the ends off the brisket before putting it in the roasting pan. She did not expect her great-grandmother’s answer. “Because my roasting pan was too small to fit the whole brisket,” she laughed. Ah-ha! Needless to say, the new bride never cut the ends off a brisket again. So three generations had been slavishly cutting the ends off their briskets, a totally inexplicable procedure, not for tradition’s sake, not because it made sense to, but because that is the way they had always seen it done. It took a true ah-ha, epiphany-like moment to recognize the absurdity of their ways and change their brisket roasting directions forever. It was Monday, the fourth of January and I was just getting back to working on my business after the new year. During the holidays my paper filing had piled up because other tasks, both business and personal, as well as a much needed break, had taken priority. No biggie. So, I asked my assistant to file away the October, November, and December papers – personal documents into the green folders labeled by month, business documents into the blue folders labeled by month. Just like she had done numerous times in the past, she opened my Procedure Manual on her computer and began following the Filing Procedures directions. Each step in the procedures is written systematically because consistency is the key to organization. If I need a particular document at a moment’s notice, I want to know exactly where to find it without having to waste time and energy looking for it. Efficiency is paramount after all. All tax receipts need to be clipped behind the Taxes cover page, all receipts reconciled against the business credit card statement and paper-clipped together in chronological order, all transactions entered in the appropriate Quickbooks fields, procedures and so on and so forth. The directions are precisely detailed so I can complete my own filing without taxing my memory or delegate the task to any assistant. Once my assistant reviewed the Filing Procedures, she proceeded to sit down on the floor with the stacks of papers from all three months and get to work. I returned to my own work on my computer and didn’t give her or my filing a second thought for about ten minutes. When I glanced back it was quite a sight to behold. My assistant was sitting cross-legged on the floor with piles of papers sprawled everywhere! She must have had 35 piles of papers circling her entire body. She looked like the center of a gigantic pinwheel with white spokes pointing out from her in every direction. That sideways glance provided the exact ah-ha moment I needed. 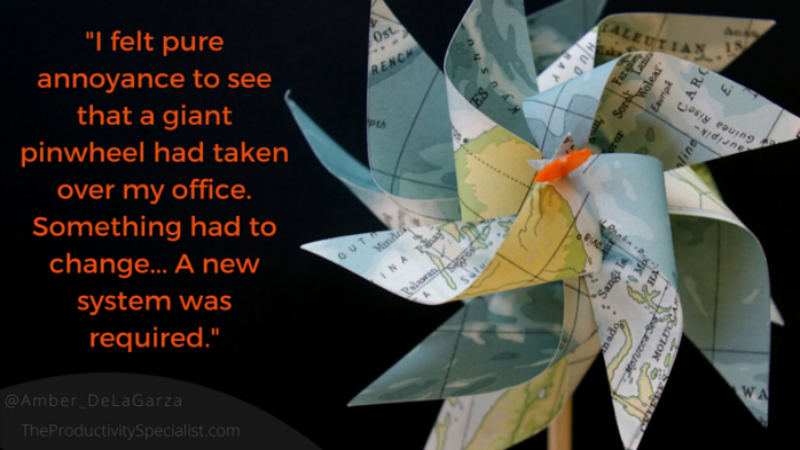 I actually felt pure annoyance to see that a giant pinwheel had taken over my office. Something had to change as my filing system was obviously no longer working. A new system was required. We didn’t have an immediate solution to overcome my annoyances but aimed to find one through analyzing them and making queries. We discussed the situation, worked backwards, and asked questions such as Why is the current system not efficient? What exactly is making it not work? What changes would make it better? We decided that due to a lack of space, higher labor cost, and wasting of time, ink, and paper, it was time to go paperless. We brainstormed solutions to go paperless and agreed that all my monthly personal statements such as gas, water, power, etc. needed to be sent to me electronically. The time it would take to set up online accounts and enroll I paperless billing would be well worth it. If I ever needed to look up a bill, I could easily do so on each company’s websites. Great. I was already receiving only electronic receipts from many other companies such as Amazon, Edgar, Microsoft, etc. I had been printing them out for my assistant to file away but we decided that step was incredibly inefficient. I could just file the receipts into an electronic folder labeled for that month on my computer as they come in by email. At the end of each month, my assistant could then just reconcile them against the credit card statement without ever having to touch a piece of paper. Great. A paperless system would also have a couple of drawbacks, too, we discovered. I receive many bills that do not have an electronic option. I also receive many receipts that do not have an electronic option – at least not before coming through my front door, that is. For example, I can’t ask places such as Sam’s Club, Starbucks, or Chili’s to give me my receipt electronically and I sure can’t ask the Office of the County Treasurer to send my Statement of Tax Distribution electronically. The end result could be a paperless system but we would have to take the time to scan in every single tiny receipt and document to my computer, just in case good ole Uncle Sam decides to audit me five years from now. No, we would definitely still have to deal with paper at some level. Not so great. Now, we have the task of editing my Procedure Manual to reflect the new system we created. We will have to type in minute detail, every step as to how to carry out the new set of Filing Procedures. We will no doubt face a few hurdles and aim to deal with them as we approach them. We plan on attacking our new system with a Trial and Error mindset in which we’ll figure out which elements are working and not working over a period of three months and continue brainstorming solutions as needed. It took the new bride’s lineage three generations to finally have an ah-ha moment in which they realized the way they had been cutting off their brisket ends before roasting was nonsensical. It took the visual of a pinwheel of paper taking over my office for me to have my ah-ha moment in which I realized my filing system needed an overhaul. You see, my filing system had worked well for years but I forgot to re-evaluate it as my business grew, the number of companies I purchased from increased, and the papers coming into my house tripled along with my household. Thanks to the accumulation of annoyances at the start of the year, my inefficient system stared me right in the face and dared me to change my ways. As a small business owner, you always have to look for creative solutions to improve the way you operate your business. Your business is constantly changing and it might be time for a complete system overhaul but start small. 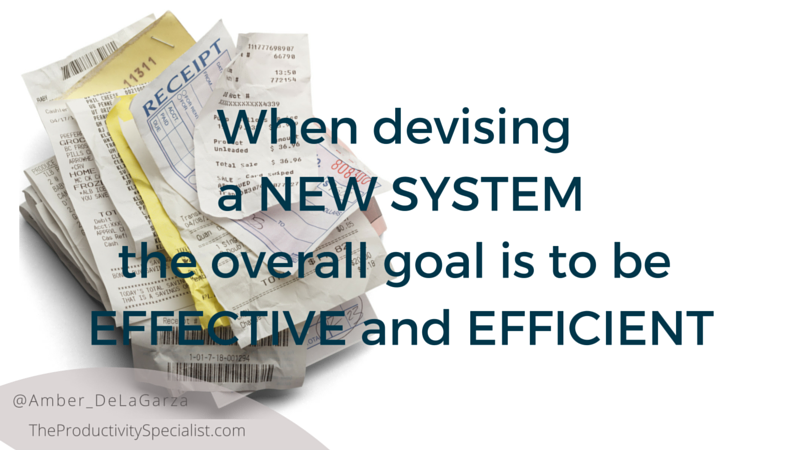 Evaluate the areas which you know are underperforming or systems which have proven to inefficient. A slight change in operations could make a world of difference in your business! lacks efficiency and revise the procedures for increased efficiency. Please share your commitment in the comments below.